Last October, I got a call about some puppies... who had been thrown in a trash bag... and then dumped in a ditch. That one puppy... was Ali. Ali was a simple black puppy… nothing more, nothing less. While I thought she was extremely special, I knew the reality for a little black puppy like Ali. Her age was the only thing working in her favor... and that wouldn’t last long. But... just before she was meant to go home… the family chose another dog instead. After that, I wrote a special blog post … letting Ali tell her story "in her own words." My hope, upon hopes, was that someone would read her story... and fall in love with my Ali. But... no one ever did. Months passed… and soon, Ali was no longer a puppy. Suddenly, she was just another black dog. I knew the chances of Ali ever finding a home of her own were so slim. I knew that her hopes may never be realized… her dreams of a family may never come true. I knew that Ali may live with me forever… and while I was okay with that… I knew that she deserved better. How did I know all of this? 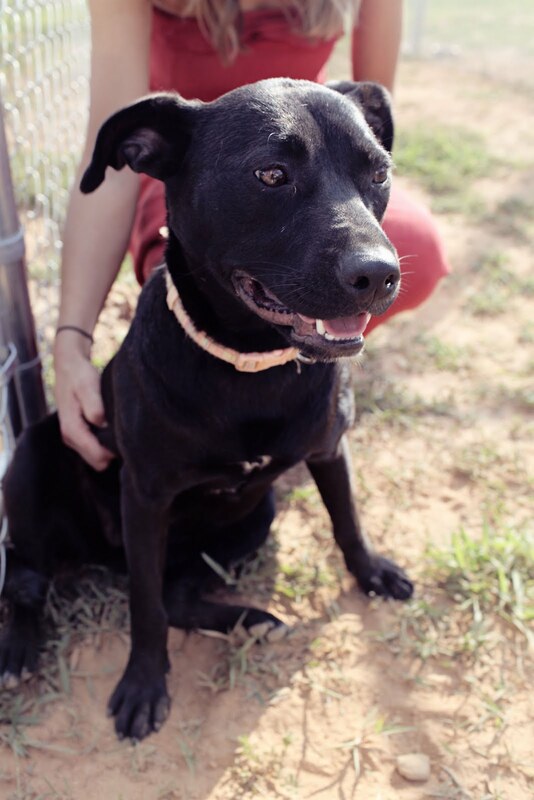 Well, I currently have six “black dogs” for adoption: Ali, Pepsi, Freddy, Lucy, Liberty, and Maddie. Five out of the six have been living with me for months or years. 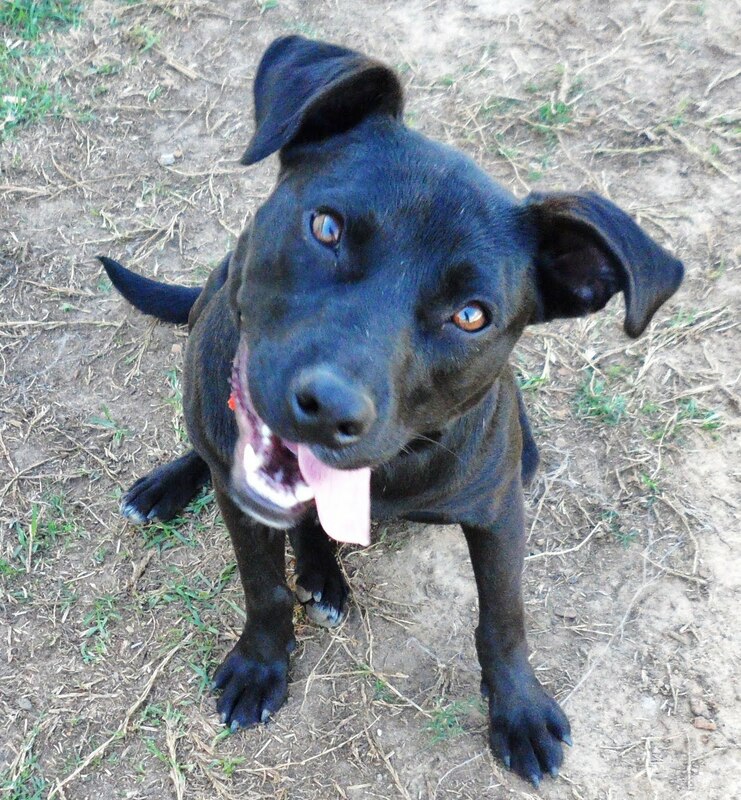 In addition, every other rescue and shelter across the nation... is packed with “black dogs.” Further, Ali looks like a smaller version of Pepsi, the black foster baby I’ve had for 2 years and counting… with no adoption requests. I hoped, I wished, and I prayed… but I knew. Because... in truth, she is mine… she’s my heart. I’d accepted that Ali would probably live with me forever, but I never lost hope that the right adopter may come along one day. Either way, I knew she’d be happy and loved.. with me, forever... and that’s all that really mattered to me. Even still... every now and then, I’d re-share my blog post about Ali, in hopes that maybe --this time-- the right family would read it. And so… my home... became Ali’s home, and that was that. Well... this week, I was checking emails, when I saw an adoption application in my inbox. I opened it, and at the top, I saw the name: Ali. Seeing her name on the app... was enough to make me cry. But as every rescuer knows, the application itself means nothing. It’s the content that matters. As I read further, I saw that this was more than just your average adoption application. This was the home I’d been dreaming of for Ali... for the last 9 months. I read it several times… stunned and completely speechless. A home? For my Ali??? 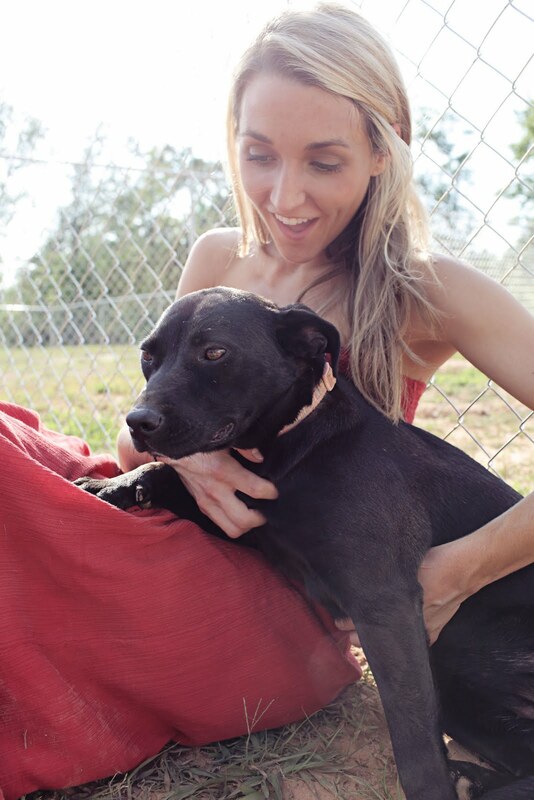 Once I'd approved the adoption, I ran in, scooped-up Ali, and held her in my arms. So we danced, we sang, and we laughed. Then I cried, hugged her, and cried some more. I held her… rocked her… and promised her... that I’d remember this moment... for as long as I live. Ali kissed me on the cheek, like she always does when I’m sad, and I reassured her that I was so happy for her… and I really am. And so, with the happiest, broken heart I’ve ever had... I said goodbye to my little Bali Boo today. She was excited to meet her new dad, Paul, and her new pup sister, Annie. And I know she'll go on to live a life of happiness and love. But she was very unsure... as I loaded her into the car... with tears streaming down my face. She couldn’t understand why I wasn’t coming with her… and she tried to stay behind with me. It ripped my heart to pieces, but soon… she’ll know that I did it for her. Everything I’ve done, since last October, has been for her. My Ali is home tonight. She’s home... for the first time in her life… and I gave that to her. While I’ll probably never see Ali again in this lifetime… I’ll love her every day, for as long as I live. And I know that one day, as she’s running through the yard, happy as can be... she’ll stop… she’ll smile… and she’ll think of me. And I have no doubt… that at that very moment… I’ll be thinking of her too. Because I’m her mom… and that’s what moms do. They love... forever. *I love you, Ali. Thank you for the joy, the laughs, and the love. I will never, ever, ever forget you. I know how you feel. We are in the process of finding homes for some of or rescues. It is very heartwrenching, but I am happy they are finding new homes. I am balling my eyes out as I type this! i'm so happy for her, looks like she has a wonderful new family, good work Lady. I am happy for both you and Ali, even thought I know your heart is broken. You are a mother to these dogs, and most mother dogs have their babies taken away. Maybe this helps you understand dogs so well. Ali will always remember you. You will always be in each other's hearts. Not only is she a lucky little girl to have found a forever home, but also to have had you as her guardian angel. Thank you for sharing this, and for being the person you are! That wad so touching, you're making me cry again. If you're ever in Florida, I'll bring Bali Boo to you! I promise to love your precious baby with all my heart. P.S. I'm amazed by how quickly you composed this heartfelt and moving message! Seems like we said goodbye (for now) just an hour ago. This is what you were put on this earth to do Ash...It's in your actions and your words that tell your story so well. Totally selfless. You are the best of what people are. And I am laying here with my black dog Pepper so thankful. With LOVE from Maine. That's awesome! any chance the new dad will update us (you) on Ali's settling in? Paul, I'm so thankful for you, for loving my baby. If only you could know the gratitude in my heart for you and Annie. This is an AMAZING DAY! Yay for Ali!!! I have been in rescue for four years and understand the heart hurt that letting them go can cause. I have fostered over twenty dogs and it never gets easier for me. The little girl who came to me starving, covered in fleas and burned with a cattle prod will forever have a place in my heart. I was crying so hard when her new mom came to get her that my husband had to do most of the talking at the adoption. I got to see my Chloe about 8 months after she went to her new home when her mom adopted another of our rescues. She now lives in a big beautiful home with the best of food, medical care, a groomer that comes to her home and most of all lots of love from her mom and fursister. She was so happy in her new home and I'm not sure she remembered me. She is now visiting nursing homes and and caring for others who have been forgotten like she had been. That's how I can take the next soul and heal their heart knowing mine will break again when they go "home". Thank you so much for what you do for these precious babies. I wish I could do the same. If only I could afford to, I would. I have three dogs now, I did have six but three have passed on from this life. I gave them lots and lots of love while they were with me and was totally lost without them. It breaks my heart in two to think of these precious animals that only want to be loved and cared for. God will reward you for caring for these helpless babies. God bless you!! Ashley, thank you so much for taking care of me when no one else wanted me and for showing me what love is all about. Thank you for taking the time to share my story. Paul, thank you for opening your heart and home to me. I promise you many years of faithful companionship. I cried when I read your blog and Ali's story. It's so wonderful that Ali has a forever home...and wonderful that you love Ali enough to let Ali go to that home. THANK YOU! And THANK YOU, PAUL, too! I pray also that all animals without forever homes get one, and also all this cruelty to animals stops, that brings them to shelters in the first place. I advocate on Pet pardons, and so many stories make me weep. God be with you Ali and your new family. My sweet dog is a rescue and is my joy and I wouldn't change a thing. I cry every time i read one of your blogs, because you put all of your heart into this work and because its a cause close to mine as well. I just read Ali's story for the first time a few days ago and said a little prayer for her. I'm so so so glad she has a forever family at last! Having fostered several dogs myself I know the seperation is bittersweet. But looking at those photos with Ali and her new dad, I see there is love already and that is the best thing one could hope for. She gave him kisses - that speaks volumes! Carry on the good work, Ashley. And THANK YOU Paul. I promised myself I wouldn't cry when I read this blog even though I know your blogs always make me cry tears - whether they are happy or sad ones. This one was no exception and I broke that promise to myself as I read Ali's story. I'm happy she found her forever home, but I feel your pain in letting her go. What a difference you made in Ali's life and all the dogs who are blessed to know you, Ashley! I had to laugh at the Bali Boo dance though! How cute!! Keep up the good work! Thank you. There is a special place in heaven for both of you one day. You are beautiful people who share the heart of beautiful Ali. Awww Ashley! This is such wonderful news! I know you'll miss your little girl but you did what any good mom is supposed to do. You raised her right and gave her wings to fly. Paul is picking up where you left off and, of course, Ali will never forget you, I'm sure of that. From one mom of beautiful black dogs to another, keep up the good work! Ohhh I so know of what you speak! It's the wonderful awful pain in the world; especially, if you've had to nurse them either as neonates, or through a health issue. But, every minute of the pain is SO worth it! Please, please, everyone that "thinks" they can't do...is one less foster home to save a wonderful animal. We CAN do it because of the lives we save. We need people to put aside their fears of falling in love, and please do....fall in love, that is. Never forget that when that special dog leaves your home, there are hundreds waiting to take it's place. Let's see if I can type through the tears. They are happy tears. Tears of a fellow animal rescuer, fellow foster. Someone that understands the pain of letting our babies go. It is very sad to see them go, but we know it's the best for them! They deserve their own home!! God bless you Ashley and all the other animal rescue people in the world. Without us so many more would die a senseless death. We've got to keep on keepin' on! Rescue Rocks!! And my passion is black dogs!! i have to stop reading these beautiful stories while im at work. mascara smeared all over my face does not make for a good presentation :) i had seen the picture but i missed this story. omg! you truly are doing gods work. this was just an amazing story - well all of them are. i remember reading your blog about this baby the first time and when i got to the part where the family picks another dog, well i had to shut the door, crawl under my desk and absolutely lost it! i am thrilled that this baby has her new forever home. this absolutely makes my day. to know that someone loves her as much as you do, that should make yours. god bless you ashley. if there is a heaven, there is a special place just for you! All your tears of heartache and joy are recorded with God. He knows the challenges you face everyday, but I think you make Him smile everyday because of the work you do. Keep fighting the good fight, it's worth it. May God bless you and all your furry babies. It breaks my heart to see the photos and read the stories of babies that have been neglected, abused, etc. But it also warms it up to know there are beautiful people like you, Ashley, out there helping in every possible way. Iam so happy that Ali has her forever home. Games have an important place in our lives and in our education for kids and adults as fell. Hello there, You've done a great job. I will definitely digg it and for my part suggest to my friends. I am sure they will be benefited from this web site.